QUESTION 1: In the past many teachers told me that if I just kept practicing, I will get somewhere, but because of many things missing (like proficiency in rhythm etc) I can sense that there is something wrong with that kind of belief, what’s your opinion regarding that? QUESTION 2: I feel that I have a very thin ``nail sound``, how can I improve that? QUESTION 3: I want to play guitar, from where should I start? The top two rows show front and back plate resonances, the lower row the air resonances. 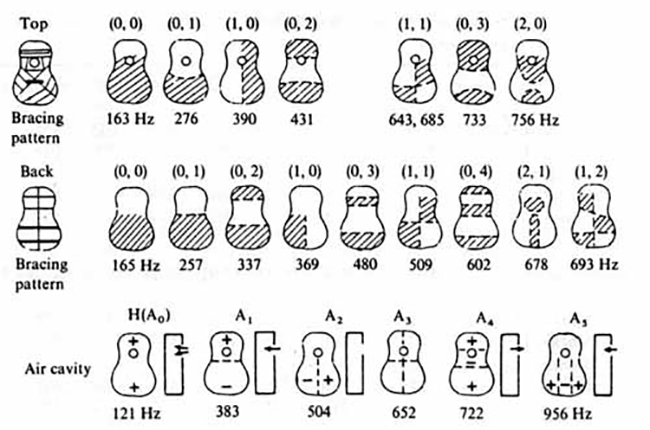 Note how many different resonant frequencies a space as simple as the inside of a guitar can have. This is a video about the percussion instrument (Cajon) played currently to accompany flamenco music thanks to Paco de lucia. It's a documentary about history of the cajón and its spreading across the world. Enjoy!